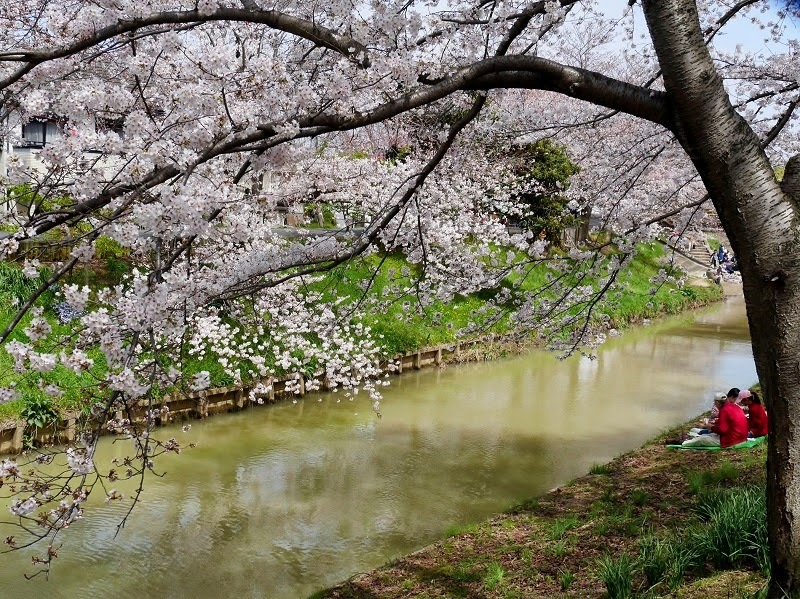 There are many rivers and canals lined up with numerous "sakura" (cherry tree) in Japan. 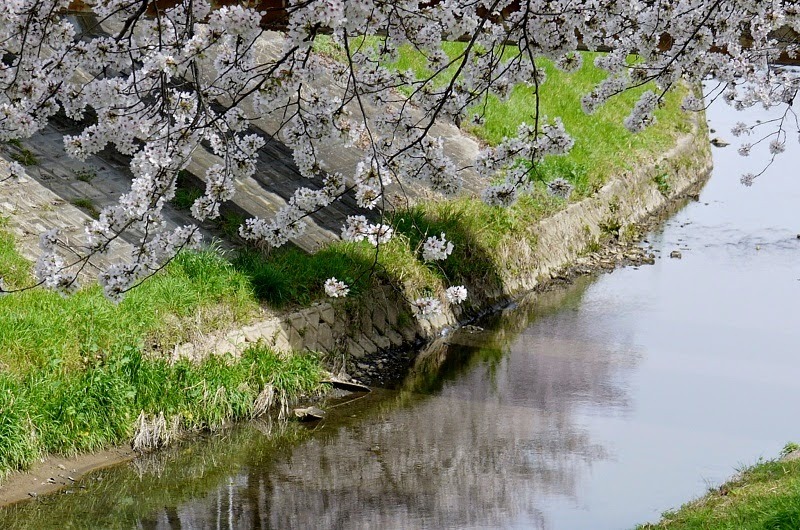 The Saho River is one of them meandering gently through Nara City. Princess Saho is believed to live in the Saho Mountain which is located to the east of Heijyo-kyo, the ancient capital of Japan in Nara. 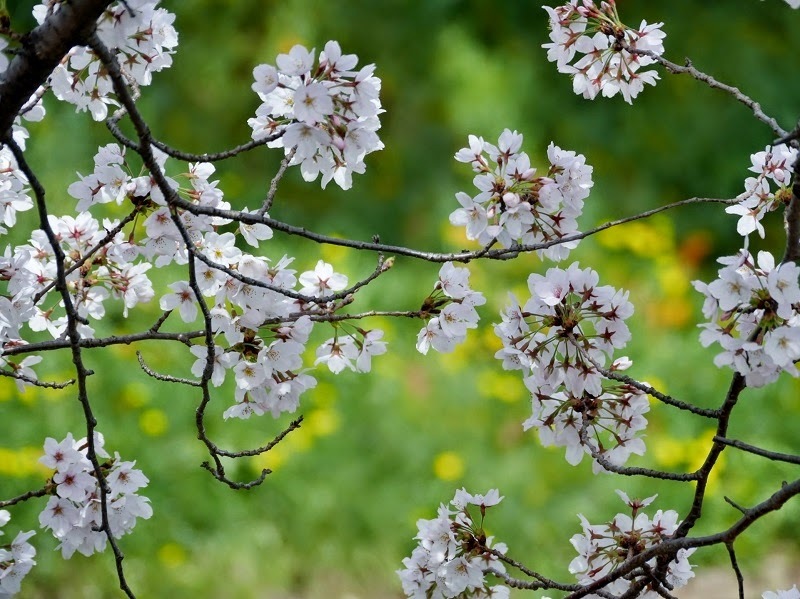 According to the Chinese theory of five elements (五行説), spring is in the east. Princess Saho is a goddess of spring, a young woman clad in a soft pale pink spring haze. She is good at dyeing and dyes hills and fields in spring colors. Incidentally, autumn is in the west, and the goddess of autumn is called Princess Tatsuta because there is Tatsutain Mountain to the west of Heijokyo . Princess Tatsuta is good at needlework and she changes hills and fields to the autumn-tinted brocades. 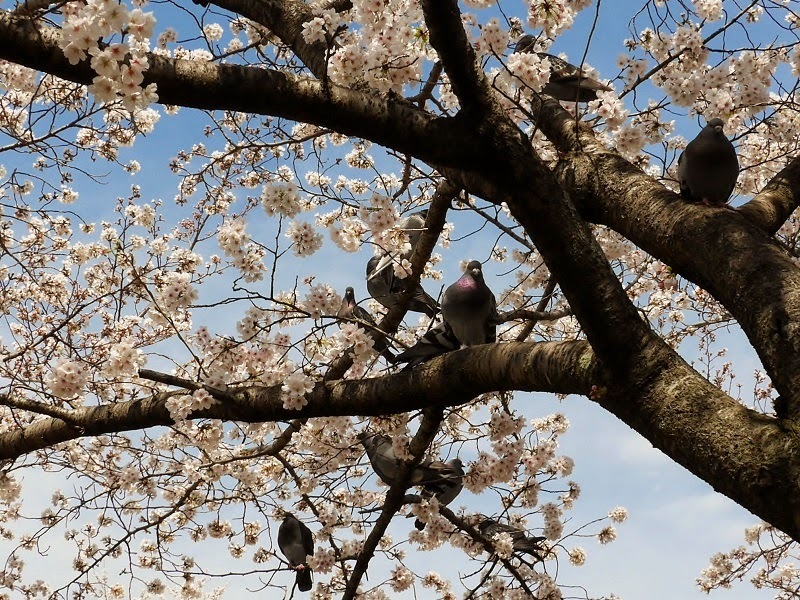 New buds of sakura get into sleep right after they are born in summer, get awake by the cold in winter, and start to swell to open when Princess Saho fly on the wind from the east. 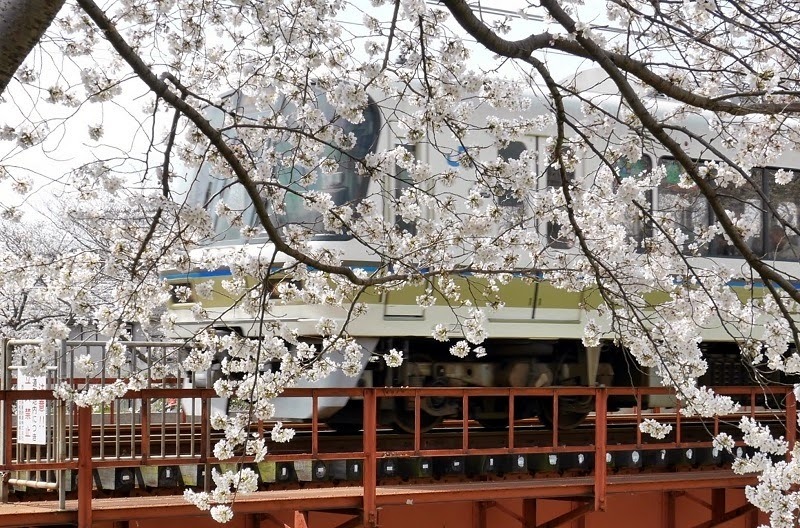 The severity of winter doesn't affect the blooming time of sakura but the time when warm east wind starts to blow does. Princess Saho is personification of changing landscape from withered mountains and fields to richly variegated by rain and dyed in verdure and spring flowers. Many people are forgetting her name while living in the city. 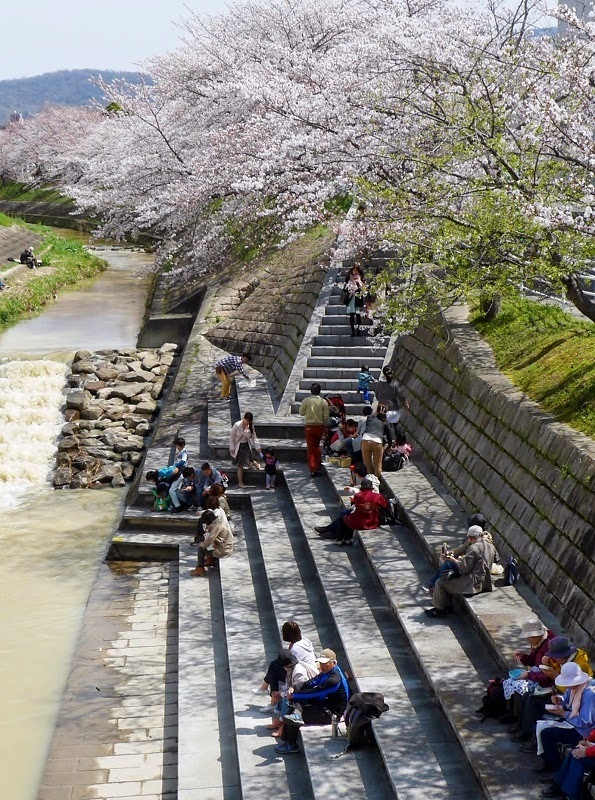 The roads along the Saho make it a breathtaking place for a springtime stroll. Yesterday I walked along the river from Nara Prefecture Library and Information Center (奈良県立図書情報館) to the upstream JR Line. 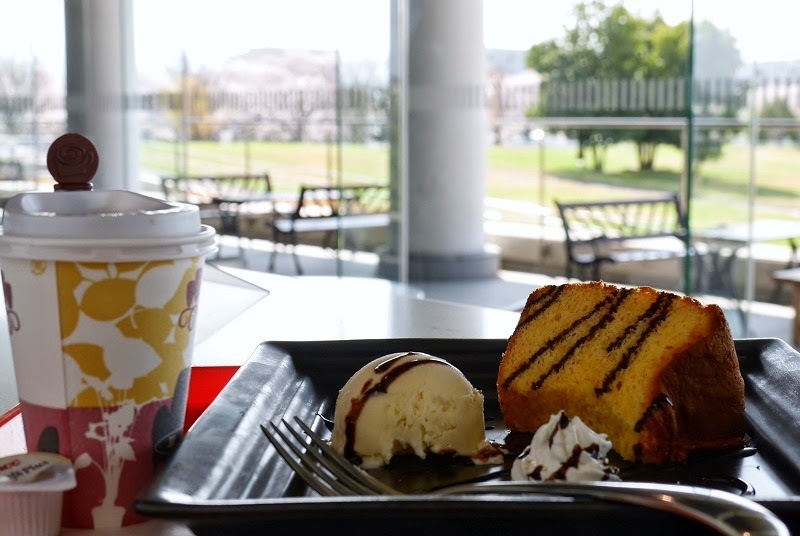 Before starting to walk, I was tempted by sweets and coffee for 500 yen. 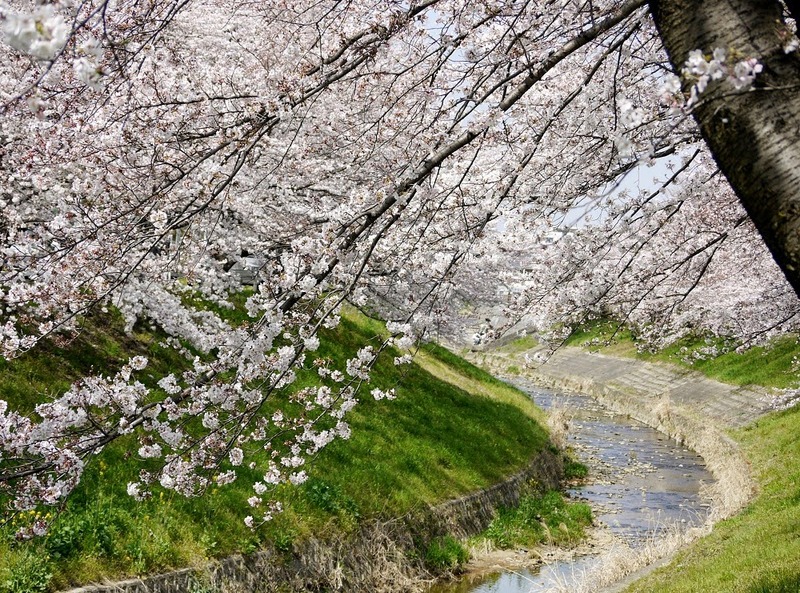 The sakura-lined paths on both sides of the river stretch about five kilometers. I walked north, feeling warm sunlight on my back. You can feel more wind by "Mamachari" riding. Mt. Wakakusa is seen from the Omiya Bridge. Saho Elementary School will welcome new pupils in a week. People were having a rest in the dappled shadow on the riverbed. 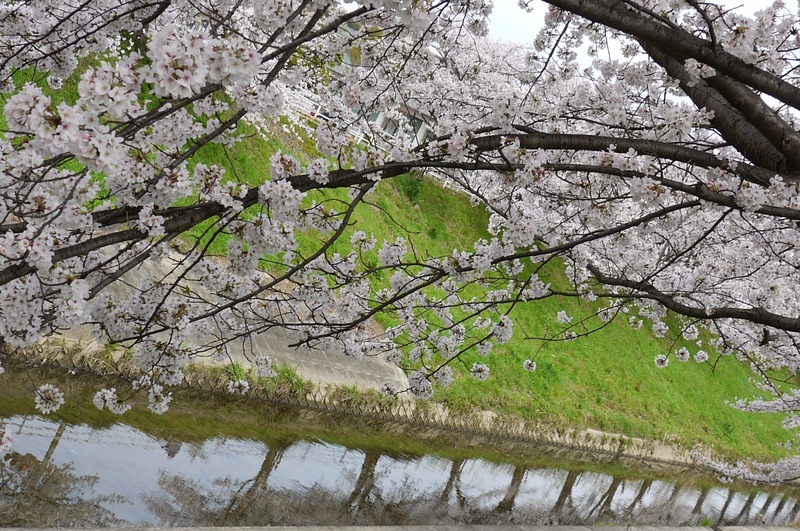 Toward the upstream, there are seen various different varieties of sakura from Somei-yoshino. 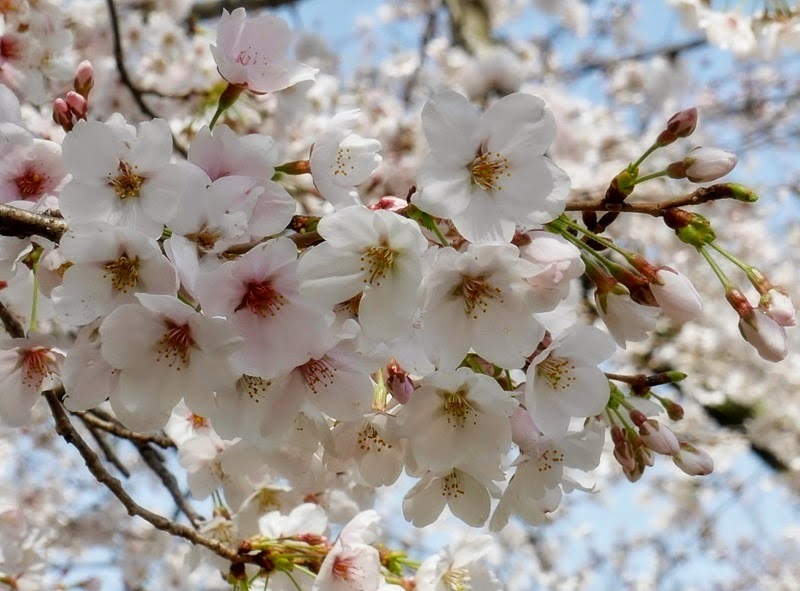 Somei-yoshino variety is noted for the pale pink petals. I took this picture while waiting for the gate of the railroad crossing to open. ﻿﻿Princess Saho in the puddle of the asphalted path? Strolling around in pink landscape would surely make you feel in the pink. I wish peace on earth and in your mind. How absolutely wonderful to be beneath these heavy branches of Cherry Blossom. Truly, they make such a remarkable sight. 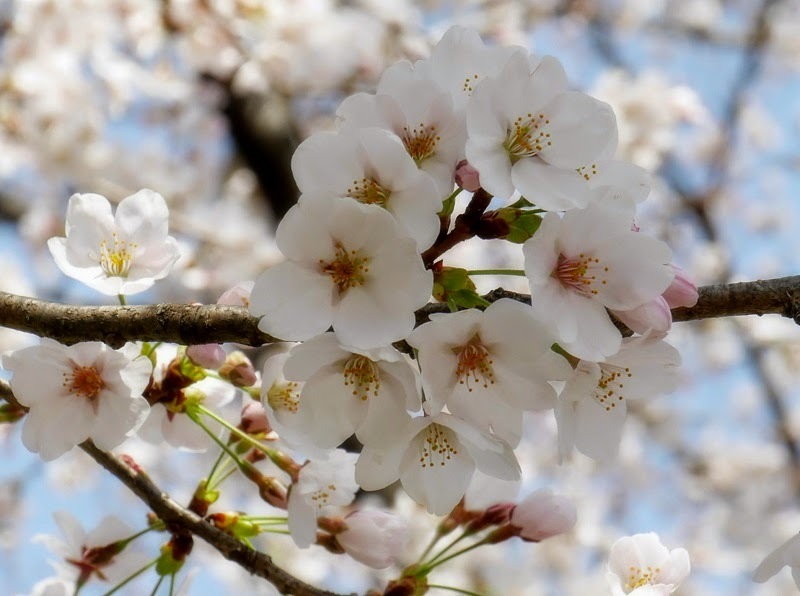 In Budapest this coming weekend the Cherry Blossom will be celebrated in a festival and, totally appropriately, it will be opened by the Japanese ambassador. 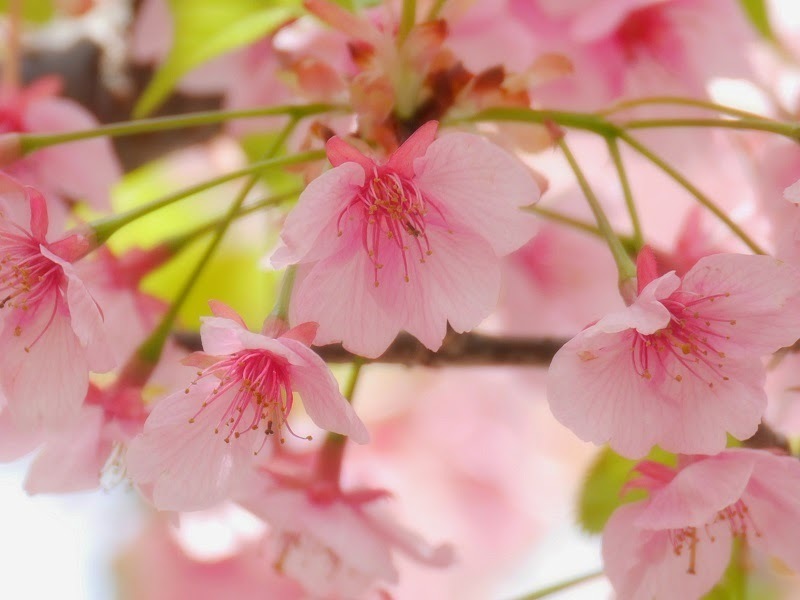 I love Cherry Blossom and really enjoyed your post and the beautiful photographs. I lived for a few years in San Francisco near Japan Town where the streets were lined with these trees and the festival they held was a glimpse of what it must be like for you. I miss the trees very much. You photographs took my breath away. I can only imagine what it was like to walk amid such beauty. 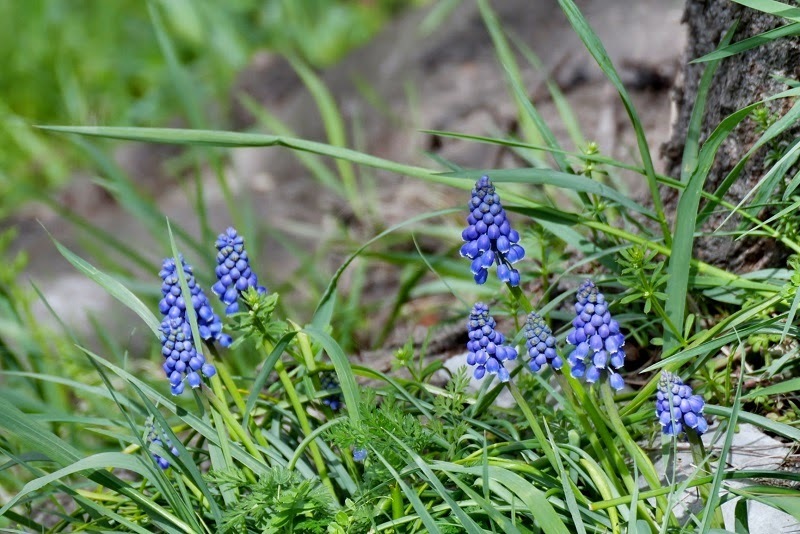 I enjoyed reading the folk tales about spring and autumn. What a beautiful time of year. 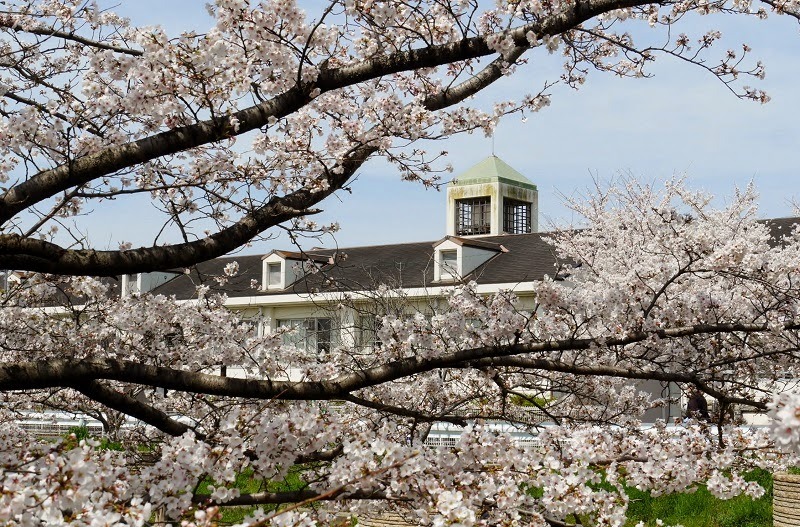 Gorgeous photos of the blossoms! 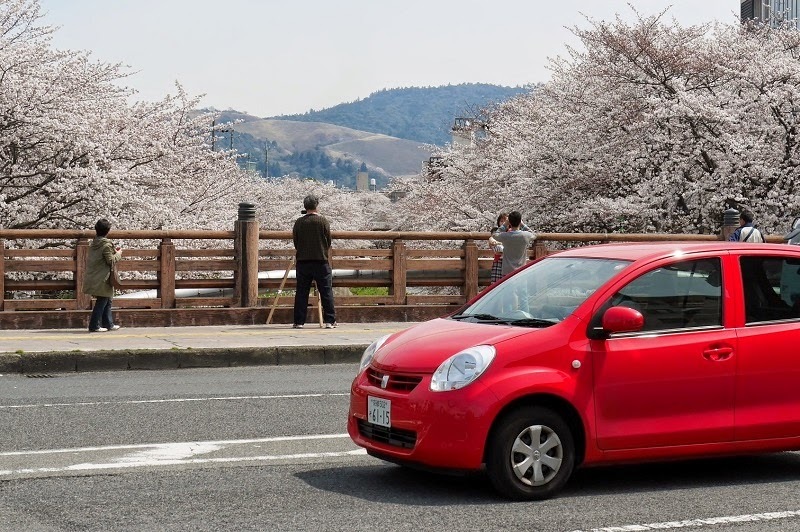 Yeah, yeah, yeah, that's exactly what I was waiting for - sakura - Japanese cherry blossom season in Japan!!! Vilken vacker stund jag fick av dina helt underbara bilder. Tänk att få gå där, jag skulle njuta så. Ni har så många vackra vyer hos er. Här är våren inte lika långt kommen, vi ha många vårblommor nu på marken men inget på träden än. Kalla nätter gör att det tar lite tid. det gör inget för då blir våren låååång och det är härligt då hinner jag njuta av allt. I always look forward to the Sakura blooms, Yoko. 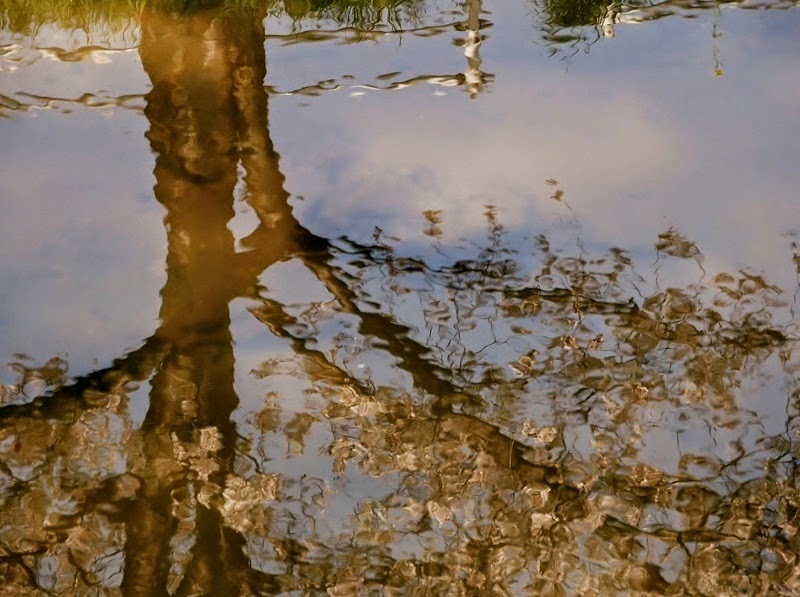 The blooms and trees reflected in water are magical. Your walk and the photos you took are enchanting. 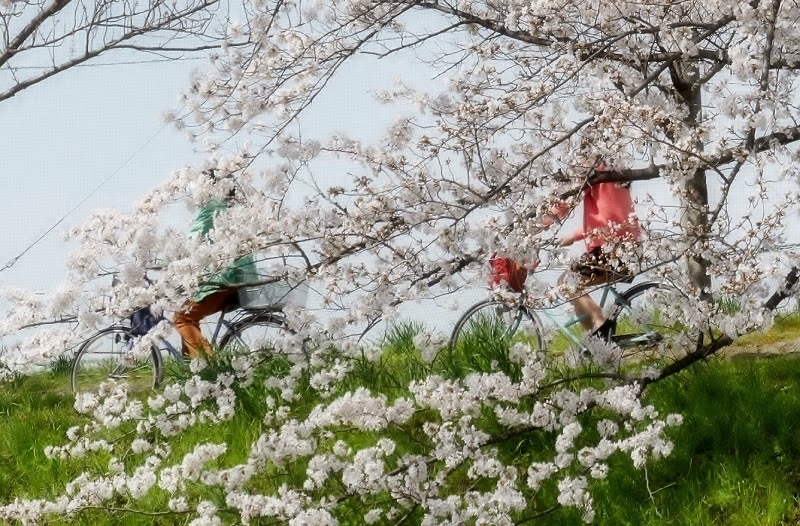 (I love the captured bicycles behind the blooming trees!) I wish I could sit with you for a treat and accompany you on the walk - but, for now, your words and photos will have to bring the Sakura to me. 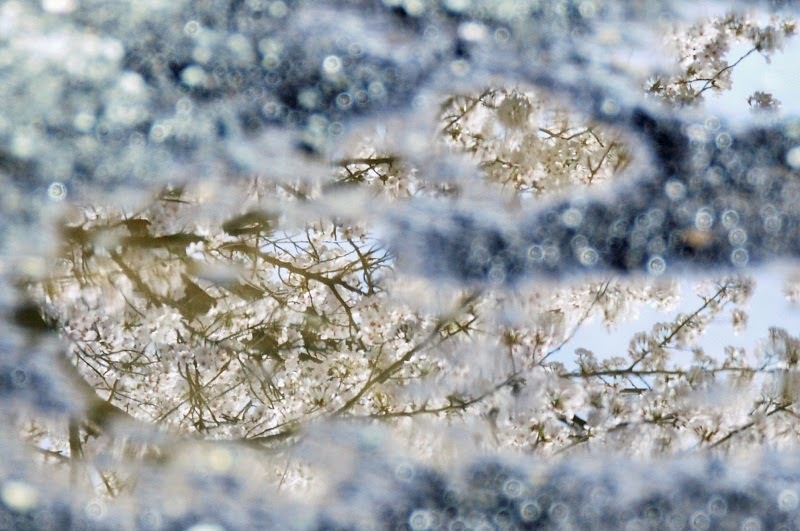 Dear Yoko - The sakura-lined paths must fill your heart with gladness as you stroll beneath them. April is surely the most magical time to visit Japan to be able to see all of these delicate blossoms so beautifully captured by you. Princess Saho certainly has worked her miracle as have you with your camera. It is sad that city people so often forget our original contact with nature. How can you not go out and expand your soul in all that transient glory? Thank you so much for another of your wonderful posts. WonderfuI post!!! Thanks for sharing such beauty! I also love reflection, your photos are stunning! Wow wow wow - what spectacular shots. You live in a fairy tale country. A walk must feel more like floating through clouds upon clouds of pink! Such a scene would make anyone feel serene. 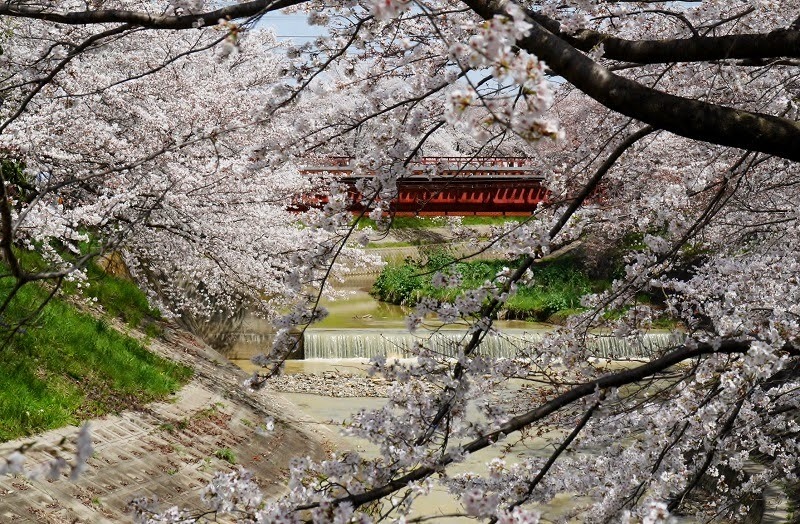 The people having a picnic by the river near the tree in full bloom are very fortunate, indeed. Japan is beautiful :) You simply rock :) Delighted to view all these ! One of my dreams is to see the cherry blomsom live in Japan! I will surely make this dream come true some day. In the meantime, I look at your pictures and feel the glorious beauty of Nature. Princess Saho has done a wonderful job of dyeing the city pink and you've made an equally fine job of showing it to us. I'm just blown away by the beauty of this place. And the cherry trees are my favorites. 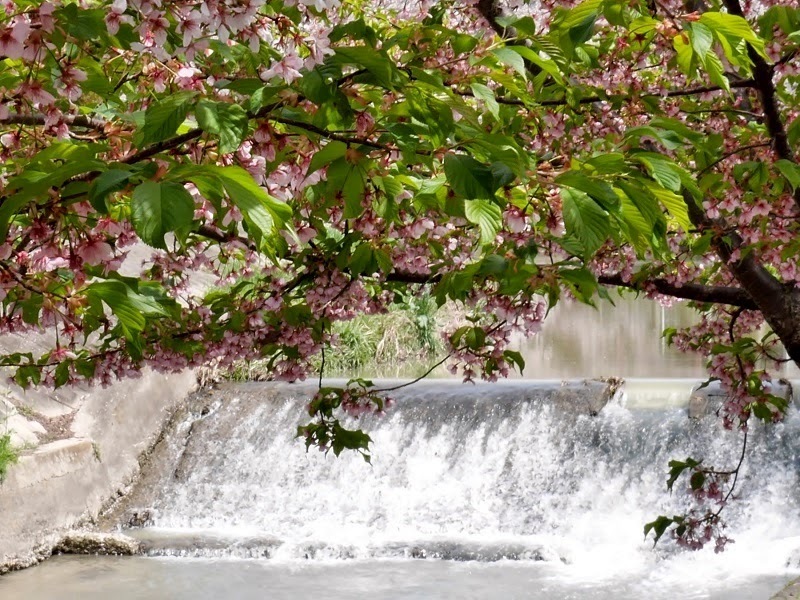 The river flowing along adds a wonderful dimension to the bursting forth of spring. Just looking at your photos has a calming effect. Once again I would add that you're a superb photographer! 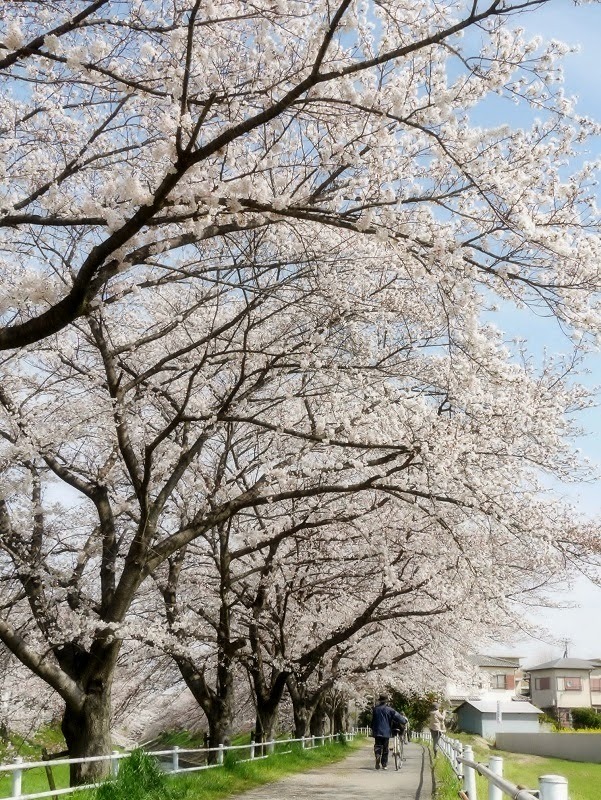 You certainly walk in beauty when you stroll along these amazing Japanese cherry blossom trees. Your photos are exquisite! Remember me..ciku..hihi..i'm travelling at hakuba,tokyo, osaka,hakata and huis ten bosh and see the sakura at ohori park and sakuranomiya park but just a few upload to my blog..i'v already back to malaysia.nice trip in japan. Thank you, Kayrul, for this revisit. Yes, you’re right, I understand what you wrote, and I was happy. What I meant on my comment to your post is that I don’t understand the language in your blog. But now I don’t have access to your blog as it is not open now. 有り難うございます arigatō gozaimasu for your kind comments, Yoko! Or: read the instruction of the editing software you use if it's possible to generate an animated gif with it. Hint: Use a stable tripod to take always the same frame/section of your photo motiv. If you then change or move any object in your setting and you take a photo of each change, then you can perfectly overlay your different photos as layers to generate an animated gif. In my "cheap" animation (with two layers) it was two times the same photo with and without postproduction / with and without distributor box. Have a great week, Yoko! Wow....... Yoko your photos are fantastic! They give a feeling of actually being there. It's wonderful you have a special goddess to assist the beautiful trees! 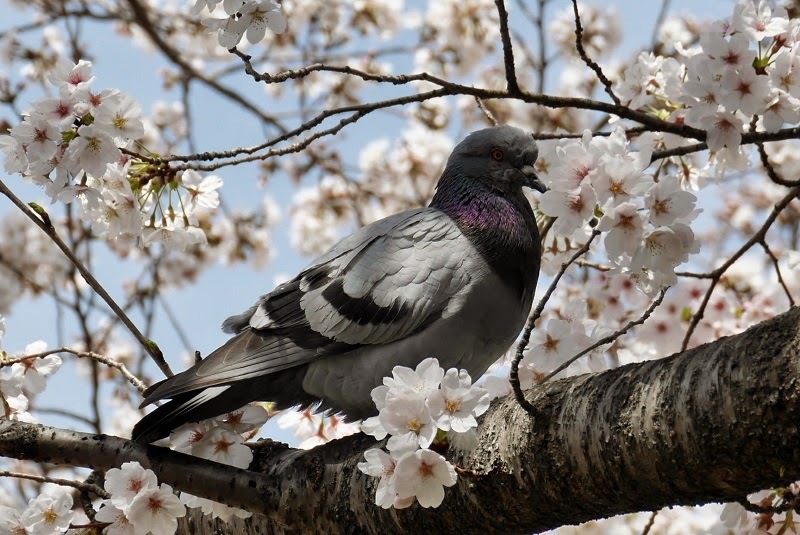 Love the pigeons........Thanks for sharing the beauty. I should have been born in Japan! So deeply penetrates the beauty of your nature into my heart. And so do stories of all Princesses. Thank you, Yoko. I wish you harmony in soul. Take care! Todella upeita kukkivia puita. Hienoja kuvia. 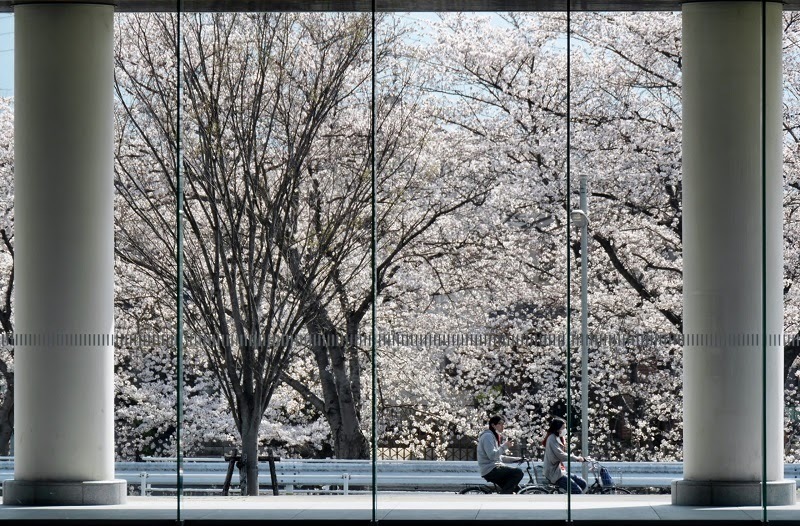 Tunnel of cherry blossoms is very elegant. 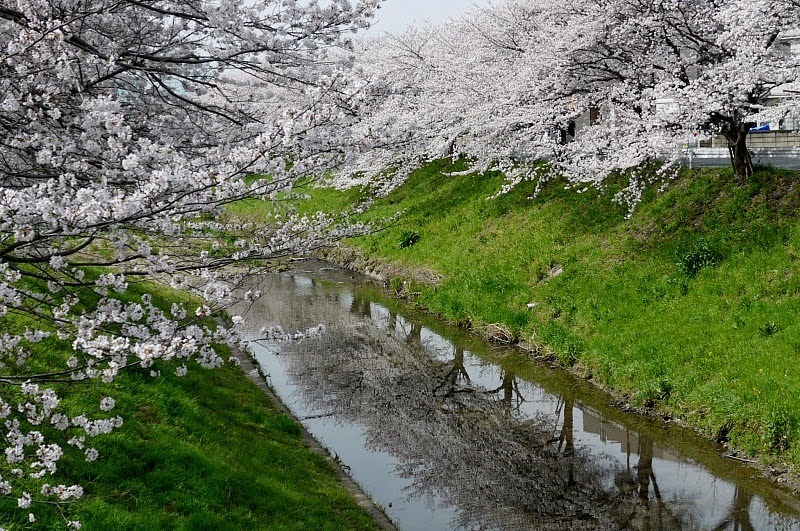 It is a paradise of cherry blossom at all. Color of pale petals will soften the hearts of us. Even in winter there about cold, cherry trees bloom flowers as usual. It is a mysterious providence of nature. Mother Nature will flow indifferently through time. The innocent is my best master. These photos are so very beautiful. A heavenly landscape, straight out of a fairy tale peopled with princesses and mystical creatures. I enjoyed your walk and your words. oh my goodness, such beautiful photographs of these flowers and lands! thank you for sharing your precious experience! Είναι τόσο όμορφη η πατρίδα σου!!! Δεν χορταίνω να βλέπω τις εξαιρετικές φωτογραφίες σου! Ευχαριστώ πολύ που μοιράστηκες μαζί μας αυτήν την ομορφιά! Blooming of cherry blossoms is our expectation.